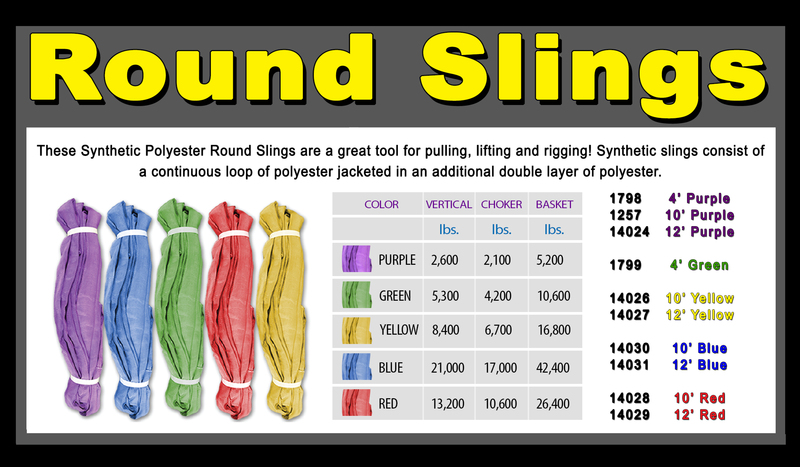 Polyester Round Slings, sometimes called dual path slings, are an alternative when web slings or nylon web slings are wider than 4 inches and 4 ply thick. Polyester round slings have a body made up of multiple wraps of polyester yarn so they do not choke lock. Our slings are made of premium grade materials for durability and long lasting dependability. Our straps are strength tested used the most stringent quality control procedures defined by the United States military so we can provide you the best slings on the market. Wheel Sling | 5/8 in x 8 ft by Tow Toolz Recover from the road side with confidence. Vertical WLL - 10,280 lbs. Choker WLL - 8,224 lbs. Basket WLL - 20,560 lbs. Wheel Sling | 7/8 in x 8 ft by Tow Toolz Recover from the road side with confidence. Vertical WLL - 18,160 lbs. Choker WLL - 14,528 lbs. Basket WLL - 36,320 lbs. Recovery Sling | 12 in x 30 ft&nbsp; Product: 2 Ply 12" X 30' Recovery Sling WLL Vertical (lbs):26,900 lbsWLL Choker (lbs):21,500 lbsWLL Basket (lbs):53,800 lbsLength (ft): 30'Body Width: 12"Eye Width: 6"
Recovery Sling | 12 in. x 20 ft (2 Ply) Product: 2Ply 12" X 20' Recovery SlingWLL Vertical (lbs):26,900 lbsWLL Choker (lbs):21,500 lbsWLL Basket (lbs):53,800 lbsLength (ft): 20'Body Width: 12"Eye Width: 6"